Every once in a while, you just find yourself reading a book that’s trying to be silly. In the late 1980s, that comic was often Excalibur. While Uncanny X-Men, New Mutants and X-Factor were playing up the drama very heavy, Chris Claremont and Alan Davis were playing up the humor of a mutant team in the U.K.. There were some serious parts, but the book found its niche in the fact that it was just fun. For comparison with this week’s book, Excalibur #14, let’s look at the other mutant titles on the stands. Uncanny X-Men had three issues that featured the aftermath of a devastated team, now missing. Wolverine was tortured by the Reavers, but escaped with the aid of Jubilee. In Wolverine, he had fought vampires in Madripoor. X-Factor is involved in the “Judgement War” on another planet with the Celestials. In New Mutants, the team was journeying through the Asgardian underworld. Excalibur was hopping from one weird dimension to another, and this one was a doozy. On a parallel Earth where magic is the presiding force in the universe, the British Royal Family is celebrating the engagement of Prince William to Princess Katherine. Excalibur is present with the Royal Family. Kitty Pryde is surprised to see Meggan dancing with Nightcrawler and Rachel dancing with Alistair Stewart. Her hidden affection for Alistair bruised, she leaves, and Captain Britain begins the get jealous of Meggan and Nightcrawler. Going back to their train, Kitty feeds Widget, responsible for their trips through realities. Excalibur returns to the train after Phoenix is offended by the lewd thoughts of this Earth’s Nigel Frobisher. When she gets near Widget, her psychic flame begins to energize him, uncontrollably sending them away to another parallel Earth. They land near what looks to be their lighthouse. When it becomes obvious that they’re about to be struck by a supersonic tidal wave, Phoenix seals Excalibur in telekinetic cocoons. She seals herself in one when her power isn’t enough to hold back her part of the wave. When Excalibur breaks out of their cocoons later, Phoenix is nowhere to be found. Fortunately, the train is all right and watertight. Rick Jones introduces himself and tells them that the Avengers took away another cocoon that probably held their friend. They climb into his Quinjet to go to New York and find their friend. 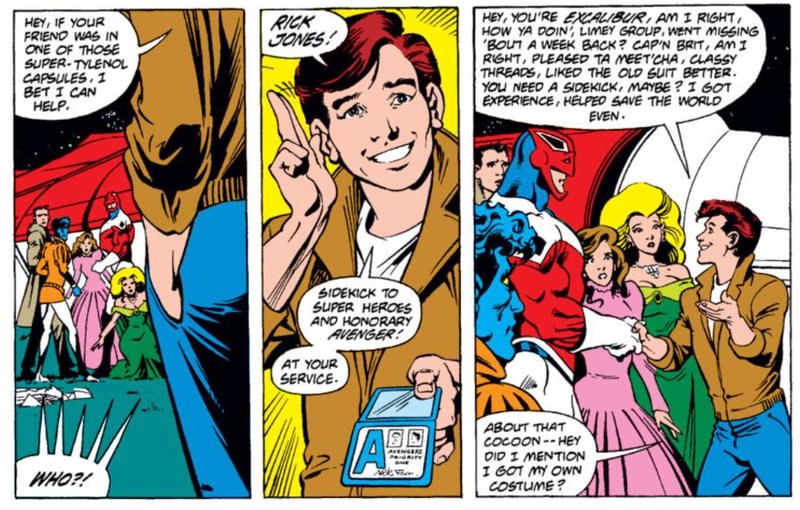 In the flight, Rick Jones brags about his time as a sidekick to super-heroes. Distracted by Meggan and Kitty cutting their lavish dresses shorter, he nearly flies into a bright yellow wall across the ocean. They pull up just enough and land at the top, in the upper reaches of the atmosphere. It’s Hank Pym, enlarged to dizzying heights, and according to Rick, with no way to shrink down. Unknown to everyone, Namor swims up by Pym’s feet with an energy weapon. He’s exacting revenge for Pym trampling Atlantis. The effects of the blast take some time, but topple the giant. Captain Britain lifts the Quinjet out of the water outside of New York, where there’s a pitched battle. Every hero is battling every villain. Captain America is a bizarre cross of himself and Deathlok, leading the charge against the villains. They split up, with Kitty and Alistair going to the Fantastic Four’s headquarters, Meggan and Kurt going to Damage Co-ordination, and Captain Britain and Rick going to Avengers Mansion. There’s an incredibly long line to get into see the Fantastic Four, mostly made up of their villains. At an increasingly bizarre Avengers Mansion, Iron Man informs Rick that Reed Richards has the cocoon. The Hulk threatens Captain Britain, who punches the jade giant with an uppercut. Rick chides the Captain for striking the Hulk, who has the mind of a child. As Rick Jones comforts the sulking monster, Captain Britain flies off to Four Freedoms Plaza. Nightcrawler and Meggan get to Damage Co-ordination. Captain Marvel, Adam Warlock, and Baron Blood are at the Complaints department, most likely because they’re dead. Mysterio gets them to try a change of clothes. Nightcrawler gets a copy of his old costume, but Meggan gets a new, green costume. They go to the lost property department to look for Rachel’s cocoon, but find that Chris Claremont and John Byrne take everything to turn into a cosmic caper, each trying to top the other. They leave to go join Kitty and Alistair at Four Freedoms Plaza, arriving at the same time as Captain Britain. In the lab, Reed Richards is examining Rachel’s cocoon. She shatters it open, wrecking the top of the skyscraper. When the Fantastic Four confront her, she sees that the powers have shifted, with Reed as the Torch, Sue as the Thing, Johnny has invisibility and Ben can stretch. 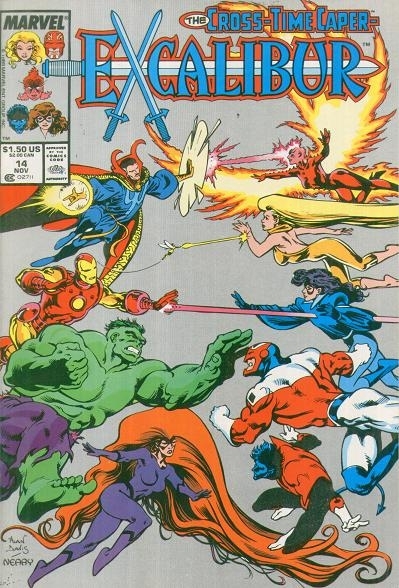 Galactus arrives and Phoenix tries to confront him, All of the heroes arrive, including the rest of Excalibur. Galactus tells Excalibur to leave this Earth while they can. Galactus assembles his machinery, stating that the planet has grown too silly to exist. He has to consume it’s energies before its madness infects the omniverse. Excalibur return to their train just in time for Phoenix to charge Widget and flee to another alternate reality. After the planet is left a barren rock in space, just as it was intended. Galactus scolds the architect of it, the Impossible Man. Galactus leaves, warning that if Impossible Man persists in this silliness, he’ll deal with him as he will soon deal with Phoenix. After Galactus is gone, Impossible Man recreates the silliness that existed before Galactus intervened. Chris Claremont could do silly pretty well. He unfolded it little by little, beginning with Hank Pym, and building to Damage Co-ordination. Some of the jokes begin to get a little too meta, but that’s when the story progresses again. Claremont, who was a master of building subplots, works the romantic angles with Kitty’s crush on Alistair and Captain Britain’s jealousy. Rick Jones is a caricature of the way he’s generally portrayed in comics, but this silliness builds on the long reputation that’s inadvertently been built by multiple writers tying him to various super-heroes. At this point, the character was pretty much a joke, but Peter David would redeem him within a few years. Alan Davis is a great artist. By this time he had firmly established his style. He’s given Nightcrawler features that are lean and rather handsome. His Kitty looks every bit of her age, which makes me relieved that Alistair doesn’t reciprocate her feelings, because that would be creepy. There look to be gags that might have been up to him to create. Some work simply because Alan Davis is a damn fine artist. Namor with feet resembling diving flippers works when drawn by Alan Davis. Even the cover is fantastic, with Davis making use of the fold on a wraparound cover to conceal the real nature of the story. from the front, as you can see above, the heroes shown look like their counterparts in the “regular” Marvel Universe. Even then, he doesn’t give away all of the gags, especially the twist at the end with Galactus. That’s where the only weakness lies in this story. Here the introduction is given to a coming confrontation between Galactus and Phoenix. This eventually was paid off way down the line. Unfortunately, it was a different Galactus, from the “regular” Marvel Universe. If you’re looking for the issue itself, then you should be able to find it with a little searching. Don’t pay more than a few dollars for it, as you can probably find a copy in bargain boxes. If you want to read it digitally, then you can find it on Comixology and of course, Marvel Unlimited. This issue has been collected in Excalibur Epic Collection: The Cross-Time Caper (ISBN: 1302910124) and Excalibur Classic Vol. 3: Cross Time Caper Book One (ISBN: 0785122028). That’s a real shame.